The first poem of mine to be accepted for publication in a national magazine was about Robert Motherwell. It bears the dizzyingly innovative but not misleading title Motherwell. It was (and is) an homage to his spectacular series of Elegies to the Spanish Republic, completed between 1957 and 1990. That Motherwell is the subject of a poem is not surprising since the main aesthetic concept for the Elegies finds its roots in poetry. Motherwell’s artistic guide was the French Symbolist poet Stephan Mallarmé, who urged artists “to paint, not the thing, but the effect it provides.” That advice is highly symbolic and highly evocative in that it foregrounds the poetic over the literal. Motherwell is arguably the most poetic American painter of the 20th century, heavily influenced not simply by Mallarmé but also by the great Modernist poets Wallace Stevens, T. S. Eliot, and Marianne Moore, as well as foreign writers such as Federico Garcia Lorca, Paul Eluard, Dada poet Hugo Ball, and Octavio Paz, with whom Motherwell eventually collaborated (Fig. 1). He even edited a fantastic anthology, The Dada Painters and Poets, that not only examined but championed the influence of art on poetry and poetry on art. A hundred years ago in France, this alliance with poetry would have given Motherwell mad street cred, but in America in the 50s, some felt it cluttered his work and subsequently damaged his reputation. On the day of Motherwell’s death in 1991, critic Clement Greenberg commented on the strange paradox of Motherwell’s legacy in the New York Times, “Although he is underrated today, in my opinion he was the very best of the Abstract Expressionist painters.” That is high praise from the high priest of Abstract Expressionism. Fig. 1. Mexican Elegy, from the book Three Poems by Octavio Paz, 1987. Lithograph on chine appliqué in a book of 26 lithographs. 21 3/4 x 18 1/4 in. (55.3 x 46.4 cm) Printed by Bruce Porter, Trestle Editions Limited, New York Published by The Limited Editions Club, New York. Fine Arts Museums of San Francisco, gift of Paula Zurcher. One of the great conundrums of contemporary American art is the delta between Motherwell’s importance and his reputation. However, three recent exhibits, all from 2016, provide a useful perspective for re-thinking Motherwell’s contribution to recent American aesthetic discourse, not simply on an artistic level but also on a political one. While the two shows on the East Coast — one at Connecticut College and one Paul Kasmin Gallery in Soho — foregrounded his formal techniques (collage and works on paper), a lovely show on the West Coast at San Francisco’s de Young Museum invited viewers to reread Motherwell’s signature series — the Elegies to the Spanish Republic — through the matrix of politics and poetry. This exhibit, which was the most literary of the three, also functioned as a corrective for the work of art in the age of Abstract Expressionism. If so much of the rhetoric surrounding the triumph of American art was about conquest, Motherwell’s was about collaboration. 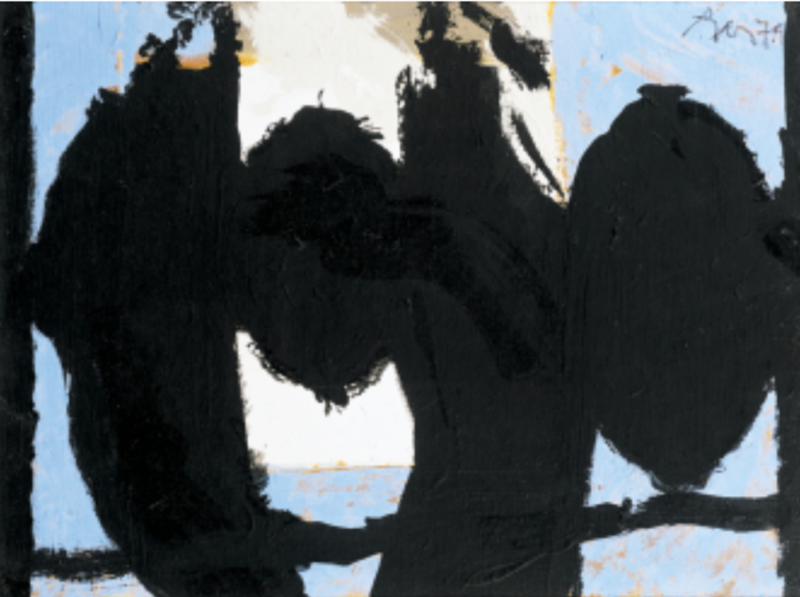 Those integrative tendencies undermined his reputation at the time and for many subsequent decades, but recently Motherwell’s Motherwell-ness seems not merely inclusive but prescient. The rise of nationalism around the globe, the backlash to the 2016 presidential election, and the increasing expectations of art, particularly poetry and painting, to enact or to embody resistance, make Motherwell’s work — especially the Elegies — particularly salient at this moment in history. It was a different moment in history when I first viewed the Motherwell exhibit at San Francisco’s de Young Museum on its opening day back in 2015. We were pre-Trump and not yet post-truth, at least not officially. The Motherwell opening happened to coincide with one of the final weekends of the massive and massively popular J.M.W. Turner show, Painting Set Free. Hung in Gallery 11, a small but beautiful room on the main floor of the museum, Between Life and Death highlighted 13 of the Elegies, all from Bay Area collections. The paintings and prints were augmented by display cases of books that help explain the importance of poetry to the Elegies in particular, and Motherwell’s oeuvre in general. A great surprise was the presence of poetry itself as part of the exhibition — not just in the cases but literally on the walls. I asked the curator of the exhibit, Emma Acker, about the poetry on my second visit, toward the close of the show. She confirmed the importance of poetry to the Elegies and explained that she set out to make this connection an explicit component of this exhibit. To illustrate this point, she obtained permission from the Dedalus Foundation, Motherwell’s educational and curatorial organization established in 1981, to include a little known poem, A Bird for Every Bird. Penned by critic Harold Rosenberg, this poem is credited with launching the Elegies. That wire in my neck up to the ear. Motherwell alters Rosenberg’s poem a bit here. He changes the line breaks, making it more vertical, to fit the scale of his own work. He also leaves out the more political lines, like “Meanwhile it was raining blood and rage,” but that may have been a decision based on scale and script rather than politics. Motherwell was not content-free but neither was he dogmatic. 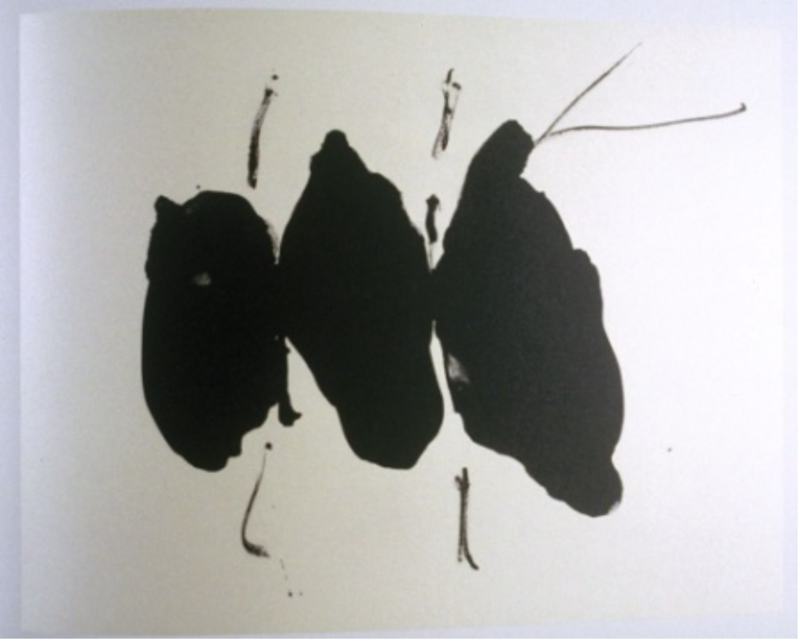 As John Yau notes, “[Motherwell] did not agree with those who believed that painting had a fixed telos or goal; and he was convinced that it was up to painters to keep art and art history open.” For me, this elision simply demonstrates Motherwell’s literary chops — he publishes the best lines. I said to him: Why do you delay? He said: Because of what you desire. And I: You command my desires . . . So sweetly the argument went on from year to year. Meanwhile it was raining blood and rage. All to avenge themselves upon the dust. Taste of the blood upon his martyred lips. To me, the correspondences between the motifs of desire and vengeance, the passion of blood and violence are not coincidences. No doubt Motherwell knew Stevens’s poem; perhaps Rosenberg did as well. Either way, both Stevens and Motherwell were interested in making their art address the injustice of fascism in Spain, but both also lean heavily on abstraction. Too literal/figural a representation would close things off aesthetically and emotionally. One of the most difficult tasks for the artist is finding the perfect balance between abstraction and emotion. Moterwell and Stevens, both masters, both land on the elegy. I want to use Hirsch’s notion of “verbal articulation” as a springboard for looking more closely at the Elegies themselves, and in particular reading them through the lens of the verbal and the lexical. 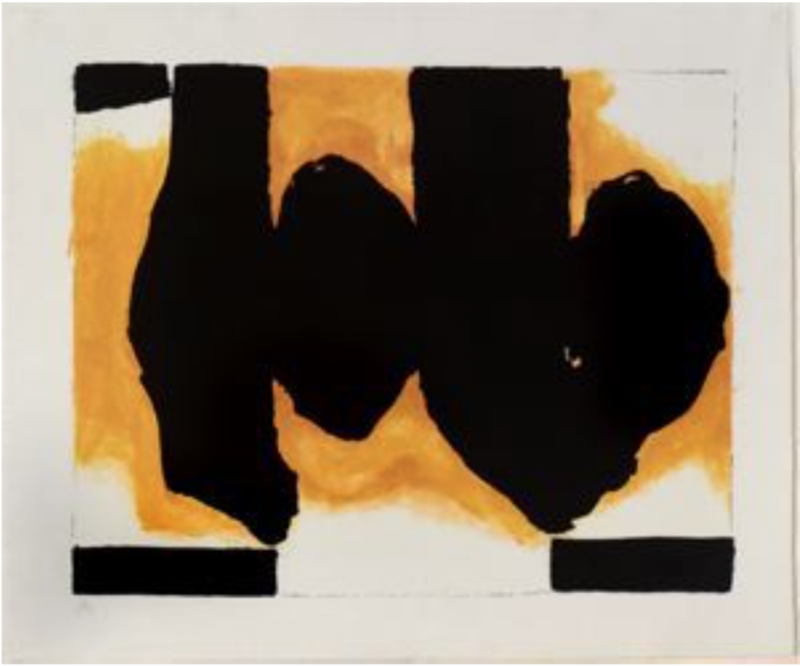 I know of no other visual artist who so perfectly marries the visual, the verbal, and the lexical as Motherwell. Consider the visual grammar of Elegy to the Spanish Republic (with Lemon-Yellow Panel) (Fig. 2). Fig. 2. Elegy to the Spanish Republic (with Lemon-Yellow Panel): Acrylic on canvas, 60 x 150 in. (152.4 x 381 cm) Private Collection. To me, this painting is gloriously mournful. The stark black and white evoke Goya and those two colors, in concert, resound with a heavy tonality of lament. Elegies, especially contemporary ones, echo the ancient and call forth the future. I see and feel both in this piece. The musical metaphors I have been using are intentional. The painting goes beyond asking the viewer to feel the sensation music creates; it actually mimics the semiotics of musical notes. The black ovals attached to the vertical lines on white remind me of quarter notes smashed together, while the yellow and blue bars suggest either a repeat sign or a double bar line, indicating a change in key signature. 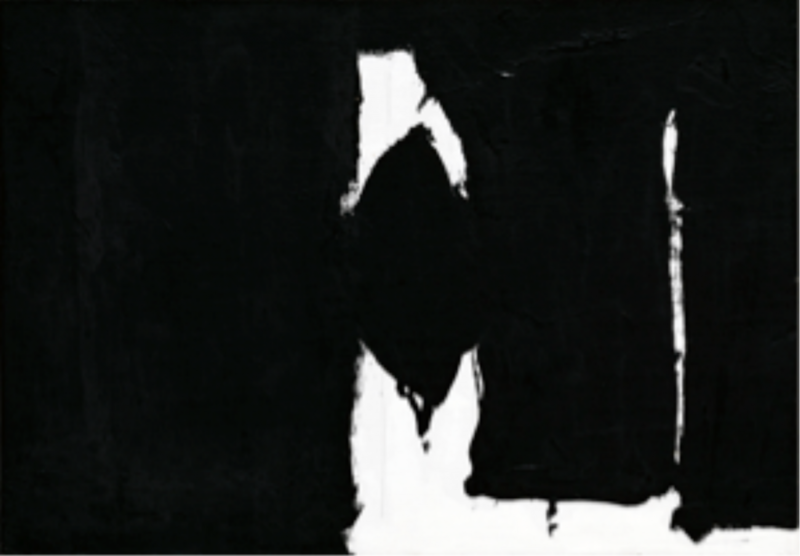 Again, rather than opting for the realism of actual note, Motherwell sounds a note of lamentation through the thematic but also the visual evocation of music. The entire painting asks you to read it horizontally, left to right, like music or text. Fig. 3. Spanish Elegy (1959). Oil on canvas board. 9 1/8 x 12 1/8 in. (23.2 x 30.8 cm) Private Collection. Cantor Arts Center at Stanford University; Gift of Professor Will Leben. Like music or text, Motherwell’s Elegies traffic in the semiotics of inscription. I always think they look written as opposed to painted. In a piece like Spanish Elegy (Fig. 3), the entire field is nothing but black and white, as though a fountain pen has blotted paper with ink. We even see the drips, the drops, the traces of the human hand. The intentional imperfection enhances the feeling of this piece being marked. Compare this to a Rothko or a painting by Willem de Kooning that relies entirely on painterly gestures, whereas Spanish Elegy comes off as fundamentally more printerly. And yet, I find these paintings more emotionally resonant than those by de Kooning or Pollock or even Rothko, though I know I am in the minority here. Many of the Elegies (this one in particular) look an awful lot like a tear. Perhaps it is some strange Freudian visual-linguistic association my eye and brain make when they read elegy and see drops of paint. That combo just calls up tear drop. But, I don’t think I’m making this up. From the side, the center oval looks like an eye leaking black drops off to the left. Is it me, or do these paintings often look like they are crying? Or bleeding? The complex visual associations of Motherwell’s Elegies have always fascinated me. As many know, Motherwell intended these pieces to evoke the splayed testicles of a felled bull from a Spanish bullfight, which he saw as a symbol of slain Spanish freedom fighters. And, in what is probably the most beautiful painting in the show, Untitled Elegy (Fig. 5), there is some serious phallic imagery. Fine. I’ll give Motherwell that, but I have to say, exposed bull genitalia are the least compelling components of this painting. Some have read these traces as his desire to impose onto the surface of the art a masculine grammar. Maybe. But I prefer a different kind of grammar. I much prefer thinking of those ovals and columns as punctuation marks. In Spanish Elegy with Marine Blue (Fig. 5), these two figures appear grounded on a horizontal line, like those on a lined notebook page. My eye sees comma, period, comma, period. Granted, I might be more grammatically inclined than most, but I’m certainly not reading into this, as my students like to say. Similarly, in Burning Elegy (Fig. 6), the four black graphics could be a small l at the end of a sentence or even a small d, as rendered by my 4-year old son. Maybe I’m stretching, but maybe not. My point is that this nod to the literary, to the textual, connects Motherwell’s paintings to their poetic origins, and it underscores a poetic influence rather than a painterly one. Fig. 5 Spanish Elegy with Marine Blue, 1977 Acrylic on canvas board. 12 x 16 in. (30.5 x 40.6 cm Private Collection. This would work against Motherwell. The worst thing an Abstract Expressionist painting could do was refer to the world outside the painting or the self. “We are freeing ourselves of the impediments of memory, association, nostalgia, legend, myth, or what have you, that have been the devices of European painting,” Barnet Newman exclaims in his 1948 manifesto, The Sublime is Now. “Instead of making cathedrals out of Christ, man, or ‘life,’” he continues, “we are making them out of ourselves, out of our own feelings.” Newman mocks the sacredness of the cathedral as well as the old-fashioned process of importing anything into art. Though Motherwell no doubt thought his Elegies were an external expression of his internal feelings, the problem was that they were feelings not only about the self but about other, foreign selves. In fact, according the Newman, the Elegies were suspect if they revealed any influence at all. Part of what critics, collectors, and other painters celebrated about the vast expansive canvases of Abstract Expressionism was their absence of meaning. They were (and are) their own influence. Nothing about the flat splatters, zips, and colors suggested a debt to Europe or the Old Masters. Free of figuration and tradition, they looked like nothing but themselves. I have often wondered if Motherwell’s resilient literary linkage somehow undermined the abstract credibility of his Abstract Expressionism. 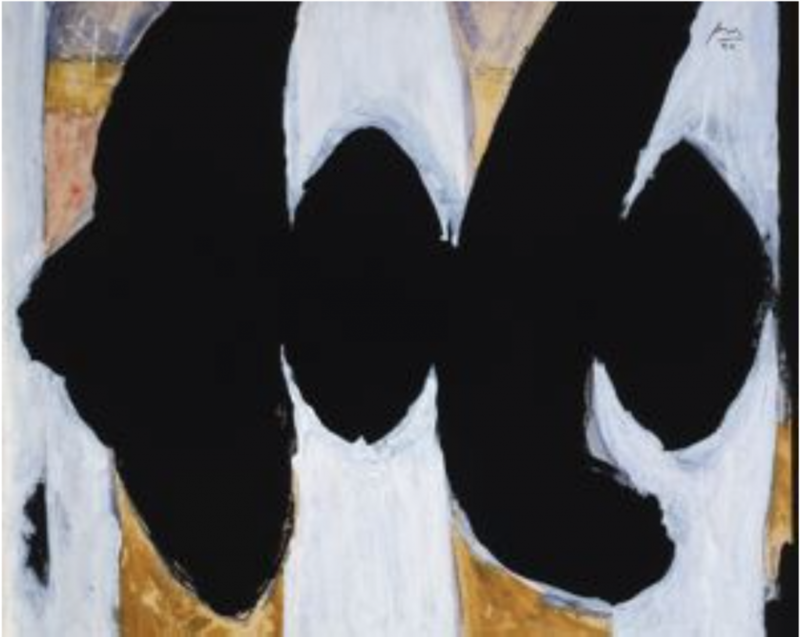 While most other painters from this movement were emptying their canvases of any kind of content — especially anything political — Motherwell was loading his up. Particularly irksome may have been his fascination with foreign writers and politics. In the 1950s, at the height of the Cold War and Communist paranoia, the enormous gestures of Abstract Expressionism somehow became symbols of American superiority. Their lack of symbology and their unfettered freedom — their utter independence — was seen by many as proof of the triumph of non-Communist Capitalist freedom. As in, see what great art freedom and free enterprise engenders? So, for Motherwell to not only not prioritize America but to call attention to non-American writers and (in particular) to lament the deaths of socialist leaning revolutionaries, was, essentially to engage in anti-American activity. There is no doubt in my mind that Motherwell suffered from what I have come to call “negative nationalism.” While other artists were looking internally — both as individuals and as Americans — Motherwell continued to look externally. He found the self outside established borders. The good news for Motherwell is that it is no longer 1950. In light of the role that aesthetic texts can play in the intellectual and political discussions of violence and oppression, his entire body of work, and the Elegies in particular, demand re-evaluation. Many recent Nobel prizes in literature have gone to those writers who see the aesthetic and the political as two sides of the same coin. Motherwell would agree. He was ahead of his time in this regard, specifically in his interest in issues and writers from Spain and what would then have been called Spanish America. His fantastic painting At Five in the Afternoon (Fig. 7) is a response to one of the most famous elegies by one of Spain’s greatest modern poets, Federico Garcia Lorca’s Llanto por la muerte de Ignacio Sánchez Mejías (Lament for the Death of Ignacio Sánchez Mejías).
. 36 3/4 x 48 1/2 in. (93.3 x 123.2 cm) Fine Arts Museums of San Francisco, bequest of Josephine Morris. Mejías, a fellow Andalusian to Lorca, was a bullfighter, critic, and poet who was gored in a bullfight in August of 1934 (one of the sources for Motherwell’s visual associations between his paintings and a dead bull). His death was memorialized by a number of poets, including Rafael Alberti and Miguel Hernandez, but nothing rivaled Lorca’s haunting, incantatory elegy. Written in four parts as though to mimic a classic musical composition, the poem actually shares many traits with Stevens’ The Men That Are Falling. However, Lorca’s poem is far more surrealistic and more clearly in line with conventional elegies. In the poem, Mejías’s death stands for something beyond politics — the loss of a loved one, the sacrifice of the young, and the inevitable fatality that awaits us all. With its recurring refrain of “At five in the afternoon” — the time, according to Lorca, when Mejías dies — the poem ceremonializes death and turns the scene of death — the actual semiotics of death — into a sacred space. under a mound of darkened dogs. No one knows you. No. But I sing to you. I sing for the future your profile and your grace. The ripe gleam of your wisdom. Your appetite for death and the taste of its mouth. The sadness borne in your valiant joy. Lorca’s prescience here is staggering. Heartbreaking. Motherwell’s elegy, then, functions as a dual elegy, perhaps even a trinity of elegies — the most enduring of which seems to be a funeral lament for the main motif of the 20th century: wrongful death at the hands of fascist governments. Lorca’s most important contribution to poetic theory was his notion of “duende,” what the poet and translator Robert Bly has defined as the sense of the presence of death. In his 1933 essay, Play and Theory of the Duende, Lorca argues that three main forces are responsible for artistic creation — the muses, angels, and the duende. That sense of the presence of death, that encroaching darkness that is both desired and feared, permeates Lorca’s work. Duende also animates Motherwell’s Elegies. For Bly, duende is the “dark sound” that rather mysteriously appears in art, music, and poetry. My earlier argument about the black lines and ovals in Motherwell’s Elegies signifying as musical notes is an expression — quite literally — of this dark sound. The black and white contrast of the paintings call up the duende of Goya, the duende of the sunlight on the dead bull, and even the duende of the black ink on the white page, the duende in the heart of the mourner, the duende of the power of the elegy. That last connection was made particularly clear in the de Young exhibit through the placement of Five in the Afternoon and a large canvas size reprint of the first stanza of Lament for Ignacio Sánchez Mejías, so that the viewer is able to move back and forth between poetic and painterly duende. 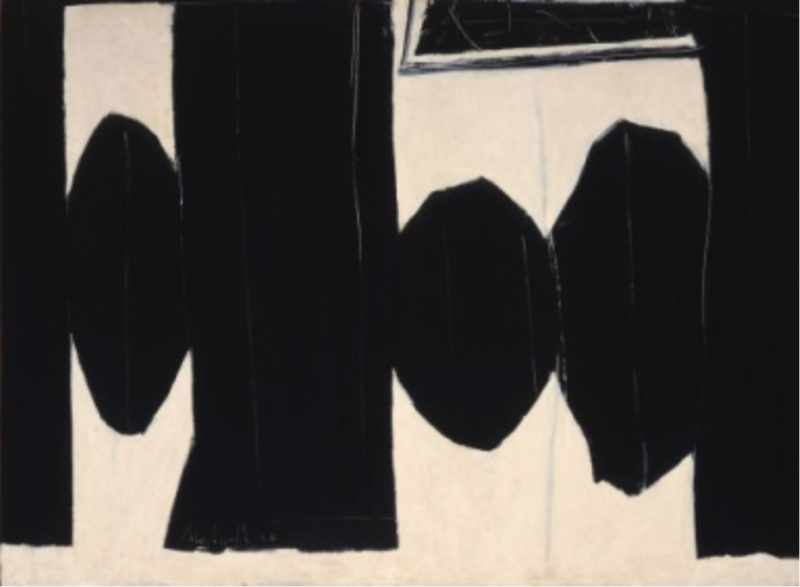 When read through the lens of duende, Motherwell’s Elegies resonate with a deeper tenor. They seem darker, lonelier, more emotionally risky. They also feel profoundly funereal. And by that I mean sacred, perhaps even holy. I don’t know that Motherwell would have attached any religious significance to his Elegies, but I do. Sometimes, the thick black vertical lines look to me to be the lower half of a severed cross. Georgia O’Keeffe’s 1929 Black Cross might stand as the visual marker for such an image, but I think Motherwell somehow invokes latent spiritual symbology in these pieces that is less obvious than mere echo and more profound than mere influence. Which is to say that all of the factors that worked against Motherwell — both consciously and unconsciously — in the minds of critics, collectors, and curators are exactly the kinds of values we now have come to seek out and celebrate in our artists. And this exhibit, though small, demands we re-read and re-evaluate Motherwell not just as a producer of large paintings, but as an artist whose work was and is a form of engagement. That’s a trifecta we need right now in the worst way.